Medianoche is a type of sandwich that was created in Cuba and is popular in late night clubs, especially in Havana and Miami. A handful of places in the San Francisco Bay Area make good Cubanos but when restaurant vets Madelyn Markoe (Tacolicious, Tres, Boxing Room) and Jessie Barker (Nopa, Tres) took their first trip to the island in 2015 they came back with a new appreciation of the culture, music and especially the cuisine. The result, Media Noche opened in early 2017 and will also be making its Eat Drink SF debut. The annual food, wine and spirits event celebrates world class chefs and restaurants August 24-27 at Fort Mason. There are several “Grand Tastings” and Media Noche will be offering tastes of their deliciousness on Saturday night. There are four Cubanos on the menu. Their take on the traditional “El Cubano” with roasted mojo pork shoulder, smoked ham, swiss cheese house pickles and mustard leads the bunch but it is the variations that demand extra attention. In addition to Cuban sandwiches the restaurant offers savory bowls, empanadas, plantains, ceviche, salads and cocktails. The savory bowls are gluten-free but that was not the intention when creating them. “That was just a happy coincidence! The rice and beans are the perfect foil for the richly seasoned slow braised meats and we add the (less traditional) coconut slaw for some contrasting acid and tropical flavor. Together, you have a well-balanced, super hearty meal that is, indeed, gluten-free,” adds Jessie. That Coconut Slaw keeps popping up on the menu as part of two sandwiches, in the bowls and as a standalone side salad. Eat Drink Films asked Media Noche’s chef, Casey Rebecca Nunes to share it with our readers. -Mix vegetables and coconut evenly. -Blend dressing ingredients until smooth. -Combine dressing with slaw mix. Media Noche is located at 3465 19th Street in San Francisco’s Mission District. For full information check the Media Noche website. All photos were taken by Molly DeCoudreaux. Everything you needs to know about Eat Drink SF is here. 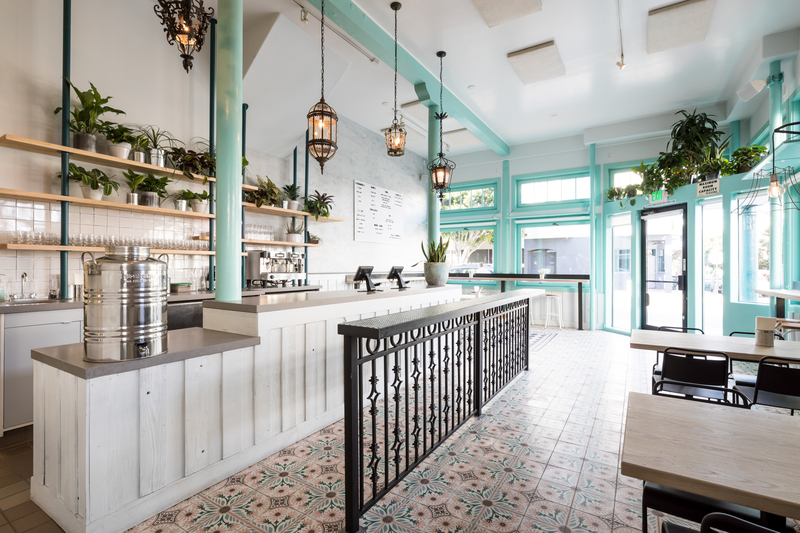 Jessie Barker brings a wealth of restaurant management and marketing experience to her co-ownership of Media Noche, a modern Cuban restaurant in the heart of San Francisco’s Mission district. Born and raised in the Bay Area, she has been honing her restaurant industry experience for nearly a decade. After completing a food studies and food management graduate program at NYU, Barker moved back to the west coast where she became the Banquet and Events Manager at the Tavern at Lark Creek in Larkspur, prior to becoming the Private Dining Manager at Tres Agaves (where she and business partner Madelyn met and worked together). After her tenure at Tres, Barker established herself as a manager at Nopa, one of San Francisco’s most beloved restaurants. When Barker made the decision to leave Nopa, she traveled to Cuba with Markoe, where the idea for Media Noche came to life. Madelyn Markoe is the co-founder of Media Noche, a modern Cuban restaurant in the heart of San Francisco’s Mission district. Born and raised in Los Angeles, CA, Markoe began working in the food and beverage industry at the young age of 12. She moved to the Bay Area to attend San Francisco State University, where she studied hospitality management and Cuban jazz music. An accomplished musician herself, Markoe has always been particularly interested in Cuban music and culture. Markoe has been deeply entrenched in the San Francisco restaurant industry for many years; she was the GM at Tacolicious in the Marina, helped turn Chino into an event space, opened Boxing Room in Hayes Valley, was the assistant GM at Tres (where she and Jessie met), and a host at Salt House. For her accomplishments in restaurants and hospitality, Markoe was named on Zagat SF’s 30 Under 30 list in 2015. She and Jessie traveled to Cuba for the first time shortly thereafter, at which time the idea for Media Noche was born and began to take shape. Casey Rebecca Nunes, Media Noche’s chef, was born and raised in Oakland, CA. Nunes was previously a sous chef at Jax Brewhouse in New Orleans and chef at The Boardroom in San Francisco’s North Beach neighborhood. Self-taught in the kitchen, Nunes has honed her skills and worked her way through the ranks of kitchens, even being named a Top 100 finalist for Season 6 of MasterChef. In addition to putting her own spin on Media Noche’s menu of Miami and Cuban-inspired dishes, Nunes is also an enthusiast of the theatre, and was previously a professional freelance stage manager and a backstage technician at Beach Blanket Babylon.